The train ride from Barcelona to Madrid was 3 hours long. The train hit speeds of 300km/h, which was the fastest train we had ever been on. We arrived at our hostel which was at the centre of downtown Madrid, the best location possible. We were at the centre of everything. 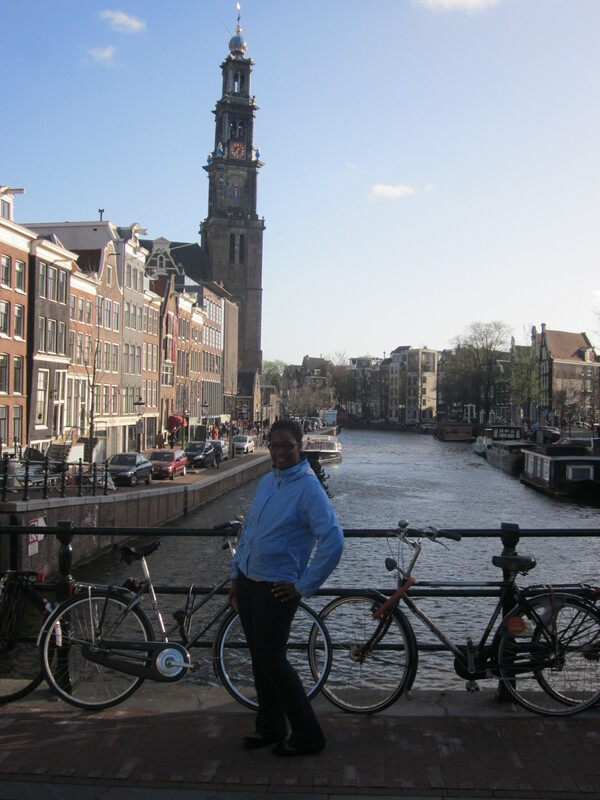 We wandered around town for a bit before joining our hostel for a tapas tour. The tour took us to three places. The first took us to a place known for the best croquetta’s, deep fried creamy potato ball things. The second tapas place had the best tapas with so many varieties and styles. I had a smoked salmon and gulas (not really sure what gulas is…) Gavin had meat in crispy rolls with egg on top. The last place we went to specialized in seafood tapas. We had a selection of mussels, calamari, octopus, potatoes and Sangria. When the tour was over we went to a nightclub where we paid €10 to have as much sangria or beer as we wanted in an hour. After an hour and a lot of Sangria we went to another bar which was fairly empty. At around 2am we decided to head back to the hostel and get some sleep. The next day was probably one of the best days we’ve had so far in our trip. 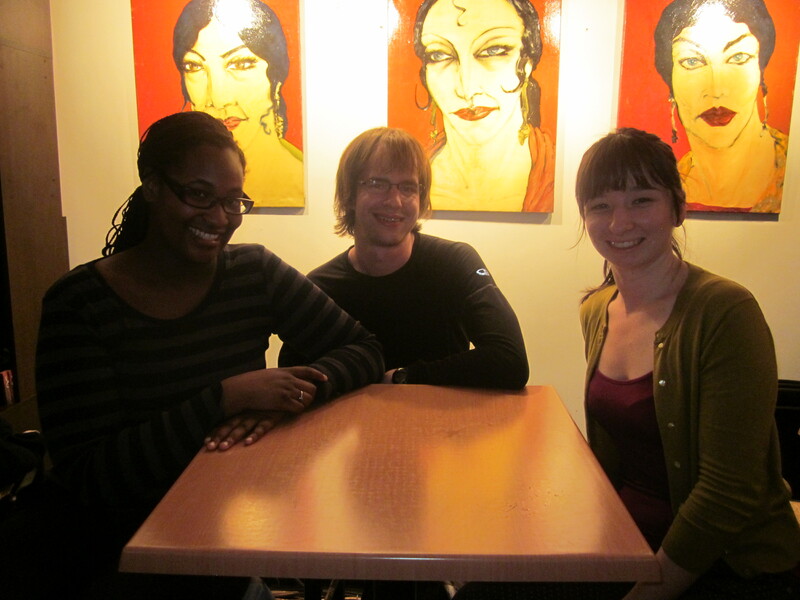 The previous night we had made a new friend, Grace. 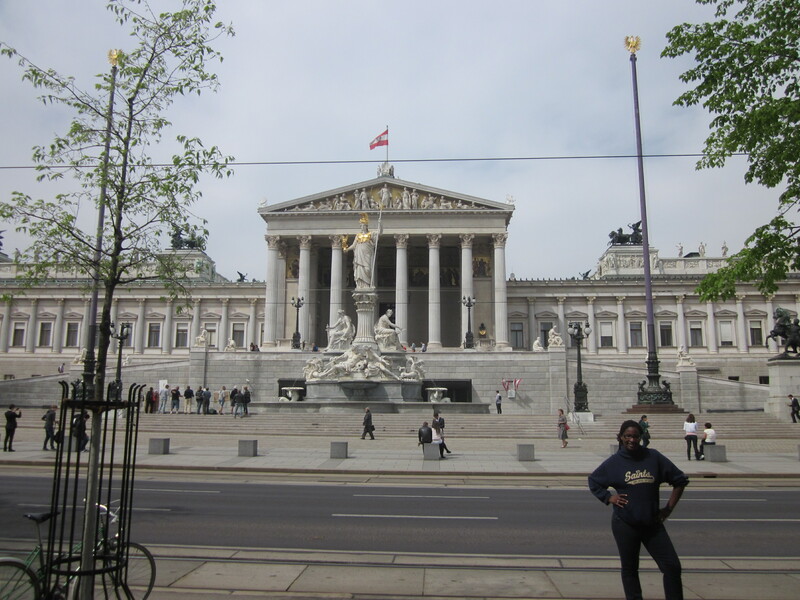 We bargained with her to come see the free walking tour with us and we would go to the Palace Real with her. Our day started off with free Churros from our hostel. These Churros were nothing like the ones at home, they didn’t have any sugar and wrapped up into a closed “U” shape. The Churros came with a thick chocolate dipping sauce. Breakfast Churros are a spanish custom, to help nurse a person back to health after a long night out. Grace had unfortunately missed out on some Churros so she disappeared upstairs while Gavin and I cleaned up our breakfast. 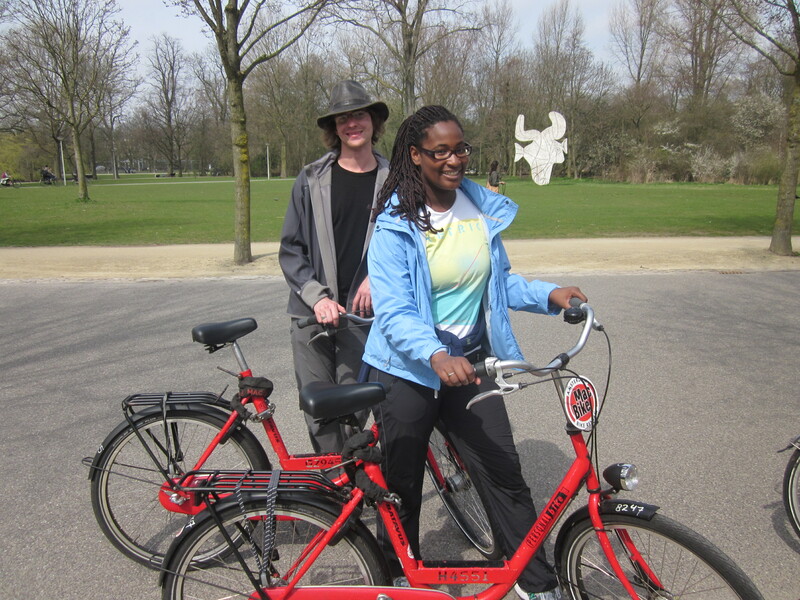 Meanwhile our tour group had left without us so Gavin and I ran to find Grace and catch up with our tour. 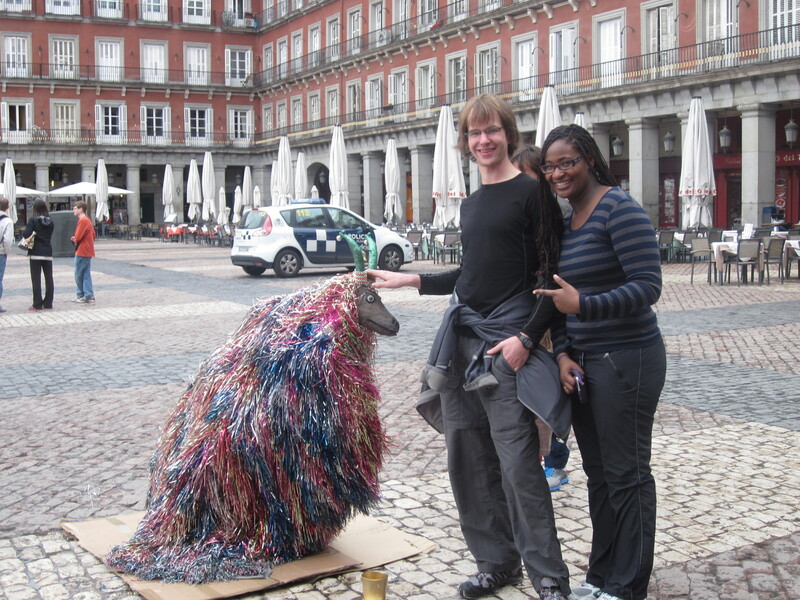 We raced to the Plaza Mayor and came to an abrupt stop when we noticed a man in sparkly goat costume. It was very bizarre and we had never seen anything like it before. We reached our walking tour and signed up. Somehow we couldn’t stop watching this magical goat thing. 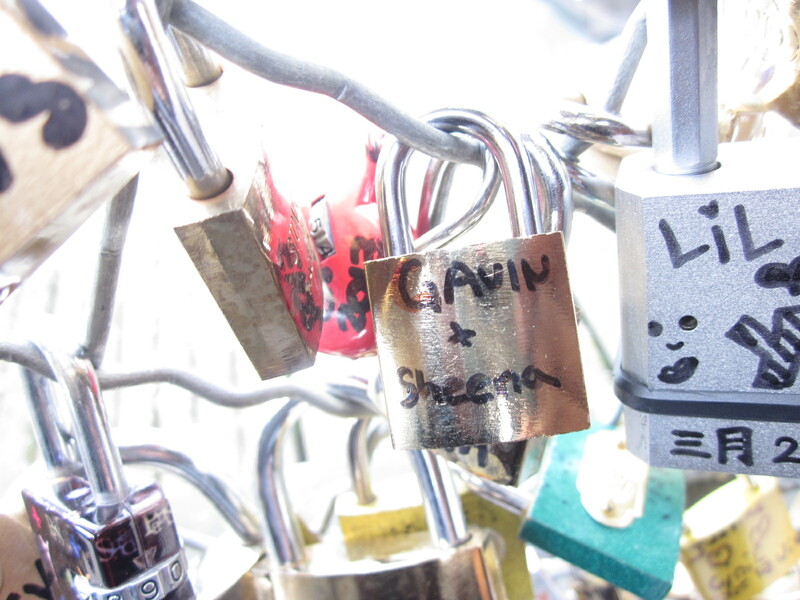 We took pictures with it and laughed as it played its little whistled tune and clapped. Every time we were in Plaza Mayor we made sure to stop by and see Sparkles. Since the last free walking tour Gavin and I did was in Munich with Ozzy, we had high hopes for the Madrid free walking tour. 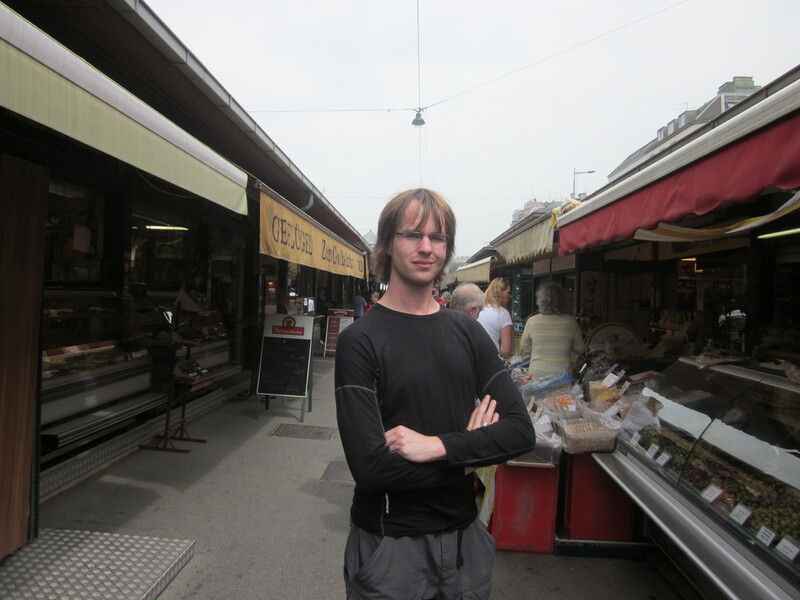 Before long we realized that the tour we received in Munich was beyond exceptional and no other tour would match it. The walking tour of downtown Madrid was informative, but lacked the magic and the local dishes of Oz Tours. Our tour started off at the Guiness book of world record holder of the oldest restaurant in the world: Restaurante Botìn, which opened in 1775 and has been operating ever since. We learned some history, saw the ugliest Cathedral in Europe (designed by three architects who all wanted glory, it took 100 years to build). We also went by a convent where nuns who aren’t allowed to see people outside of the convent baked sweets and sell them without being in the presence of the customer. 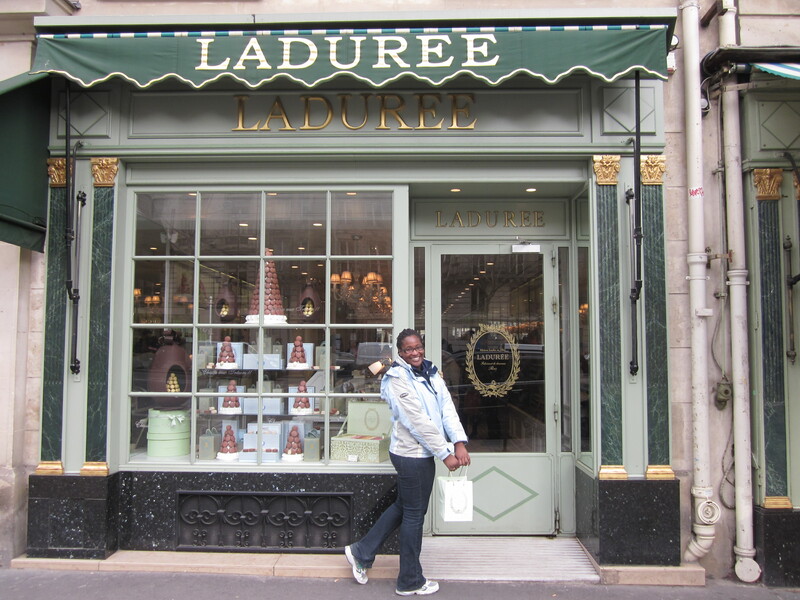 They were out of sweets so we didn’t get a chance to see the nuns not see us. Later we went to a Granville Island like market and I bought the biggest macaron I have ever seen, it was the size of a mini hamburger. It tasted fantastic but I can see why they don’t make them that large. Gavin, Grace and I shared some Paella at a restaurant across from the Palace Real. Grace noted that he Paella tasted exactly the same as one she had in another restaurant. I noticed that this restaurant had 5 different menus for some reason, and that was when we noticed a trend. At least 75% of restaurants in Madrid sold the exact same Paella, frozen pre-made crap. Apparently the locals don’t even eat Paella. This revelation was disappointing to say the least. After waiting for about an hour we finally got to go into Palace Real of Madrid. 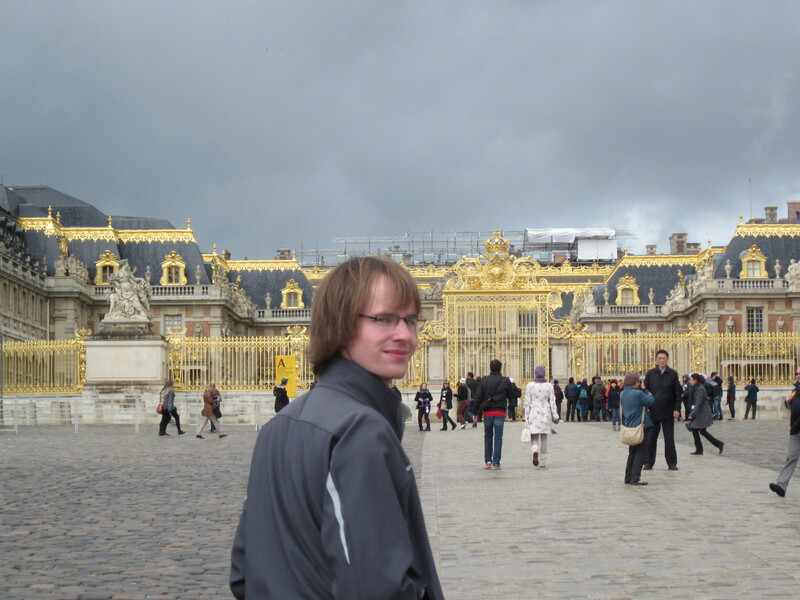 This was the most extravagant palace I had ever seen, we weren’t allowed photos, but everything was bigger and grander than any other palace I had seen. There was an entire room, floor to ceiling, made of porcelain and gold! 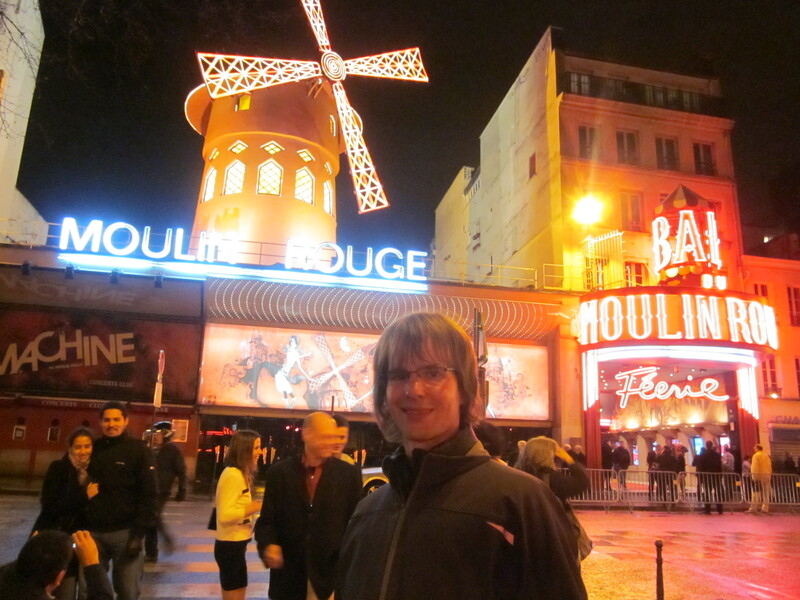 Later that night we went to a Flamenco show. None of us had seen Flamenco before so we did not know what to expect. We sat down in a dark room and ordered Sangria and Tapas. Suddenly three men standing behind three women in chairs started clapping. Two guitarists started playing classical Spanish guitar. Everyone on stage started belting out loud passionate Spanish and each of the women and one of the men stood up one by one and dancing to the music. After the song was done, each dancer had their own solo, one more passionate and angrier than the last. The quick movement of their feet dazzled us, we had never seen anything like it before. After the show the three of us wandered back to our hostel to find a large sum of about 5 thousand people had gathered in Plaza Del Sol. It was from what we thought a regular Wednesday night before Easter, and we saw a giant Virgin Mary surrounded by lit candles in altar being carried around the plaza with a band playing. We had remembered seeing some partitions near our hostel and realized that the partitions were for the Easter procession. We decided to run ahead of the Virgin Mary procession by taking a side street to our hostel. Instead we found ourselves faced with an equally elaborate Jesus altar being carried followed by an even bigger band. We were a bit bored of the procession until something caught our eye. Several people dressed in what looked purple and white KKK outfits. We had seen this image during other catholic processions in our travel book. It shocked us to see children and infants in these hooded costumes. 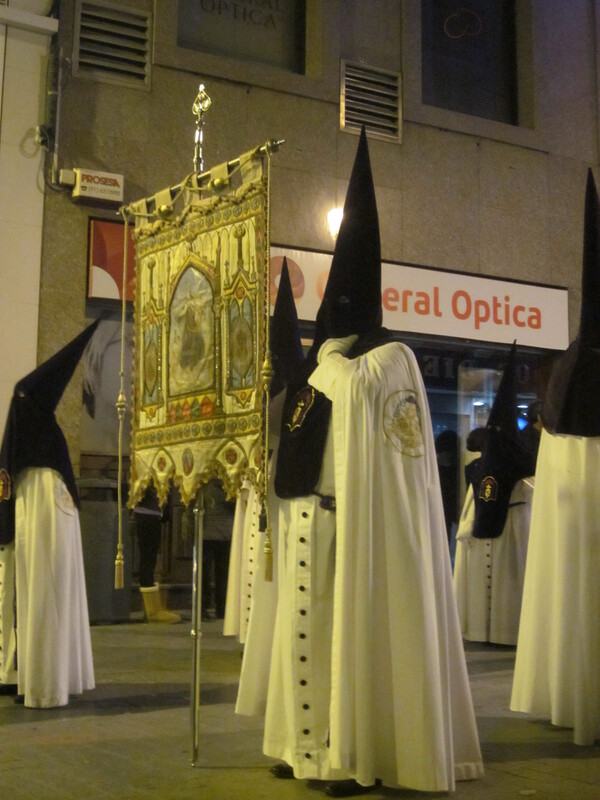 The white capes and pointed purple hoods were shocking to us but had a different connotation in Spain. The procession was long and moved slowly, it stopped occasionally so the people carrying the altars could rest. It looked like each altar was carried by about 30 people all hidden beneath the altar. After the altars would pass, spectators joined the procession leaving the street sides empty. When the procession had ended the three of us were exhausted from a long day. The next day Grace had travelled on to Barcelona and the two of us hung around for a quiet day. We went and had some more Tapas at that amazing place we went to two nights before, we then stopped by the Chocolateria, this famous Churro place that made the best Churros in Europe and was visited by many celebrities. We then went to the Praggo Museum of Art and saw many local paintings. That night we had decided to stay an extra night in our hostel but unfortunately there was not very much space so we ended up in separate rooms on separate floors. 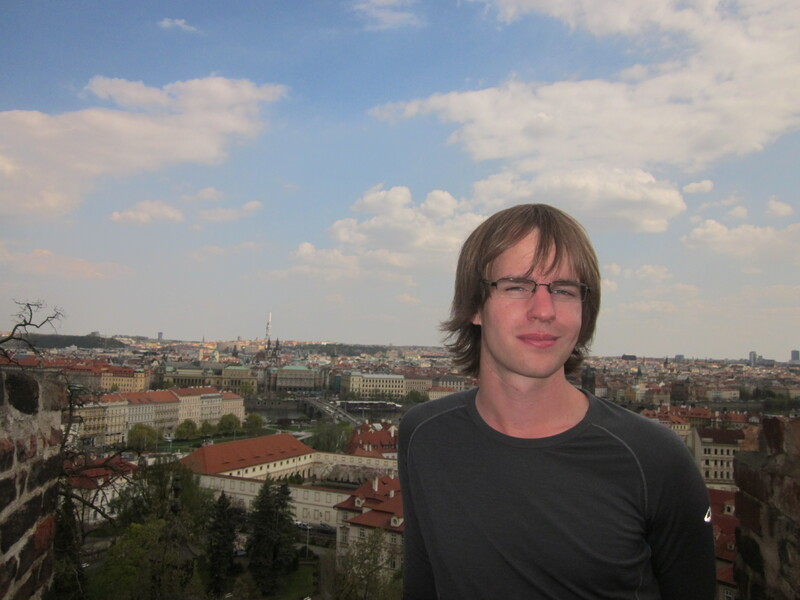 My room was shared with two girls from Austria, Gavin shared a room with 9 other people. We woke up the next day to do a day trip in Segovia, a town 35 minutes away by high speed train. 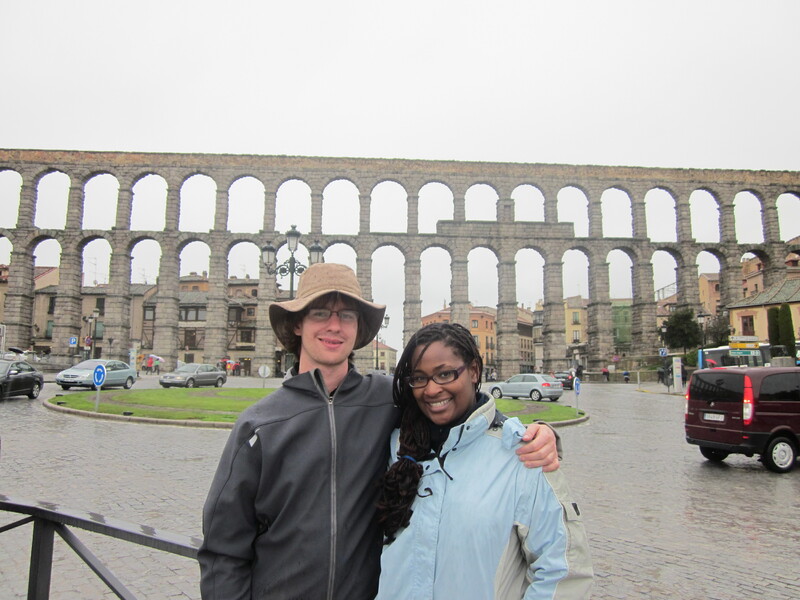 Segovia was home to an aqueduct that was an international historic civil engineering landmark. It was completed in the first century. It started pouring rain and we decided to get down to business; we walked up hill towards an elaborate Catholic Church. 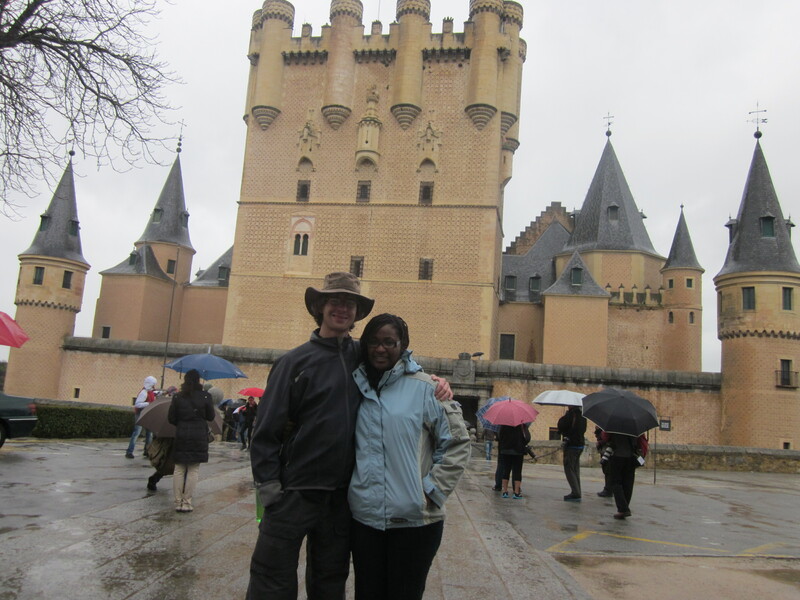 We toured the church to get out of the rain, then we jumped back into the pouring rain and walked to the Alcazar castle. The castle was one of the most classic fantasy type fortresses we had ever seen. It is said to be one of the castles that inspired Walt Disney’s Cinderella castle, with pointed blue slate towers, a plummeting moat protecting the entrance, and a central rectangular keep accented by at least 8 circular towers along the top. It was all built on the edge of a hillside, with the rear protected by steep cliffs. We were able to tour part of the palace, including the old throne room, dining area, sleeping quarters and grand hall, with numerous balconies. Paying a bit extra allowed us to climb a tight winding stone stair up one of the corner towers to the top of the keep, allowing us to get a breathtaking view of the surrounding countryside. This fortress served as one of the worlds best artillery academies for about one hundred years from the mid 18th to 19th century, and so also had a museum dedicated to the science and manufacturing of cannons and mortars. It included many preserved weapons, scale models of manufacturing processes, preserved original textbooks and a small mineral collection thanks to the chemistry lab that was dedicated to improving gunpowder. After touring the castle we caught a train back to Madrid. We spent one last night in Madrid before catching a train back to Barcelona. 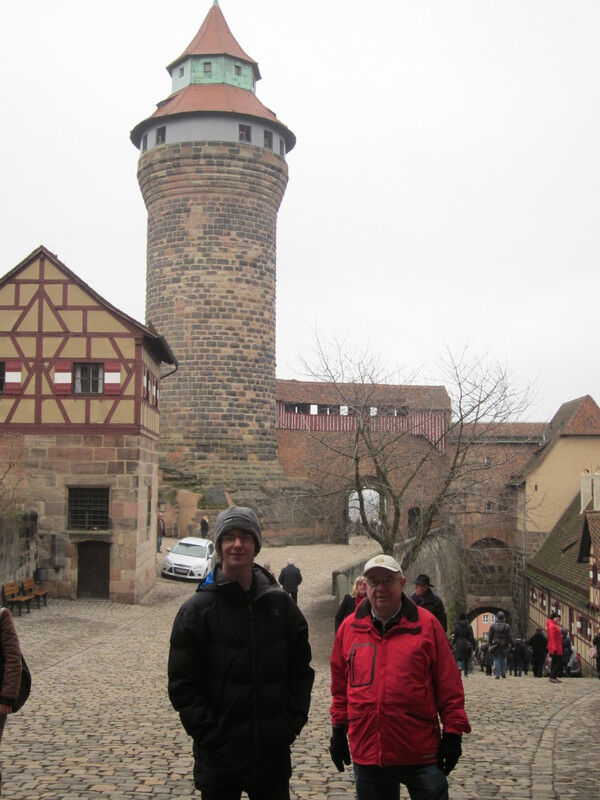 The day before yesterday my step-dad Joe, Gavin, and I went to Nuremburg. We hopped a commuter train from Ansbach to Nuremburg. 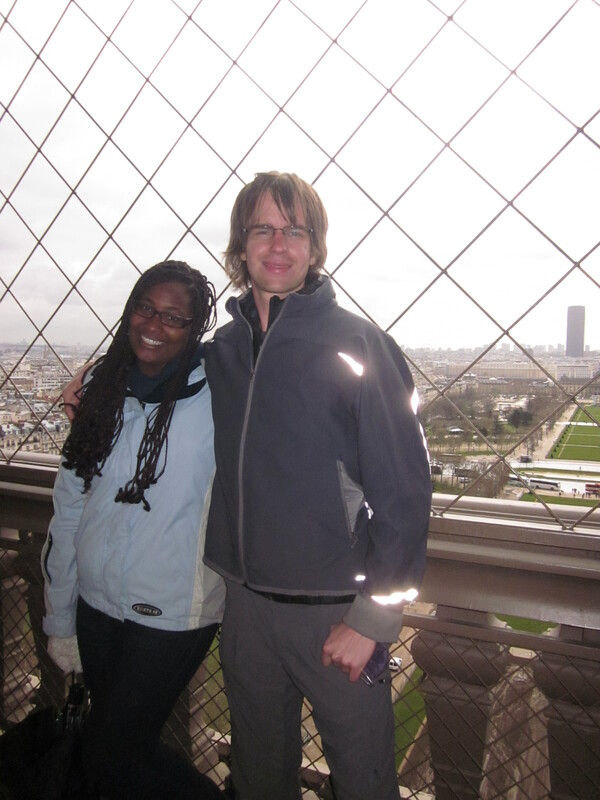 Gavin had never taken a train in Germany before so it was pretty exciting yet at the same time uneventful for him. 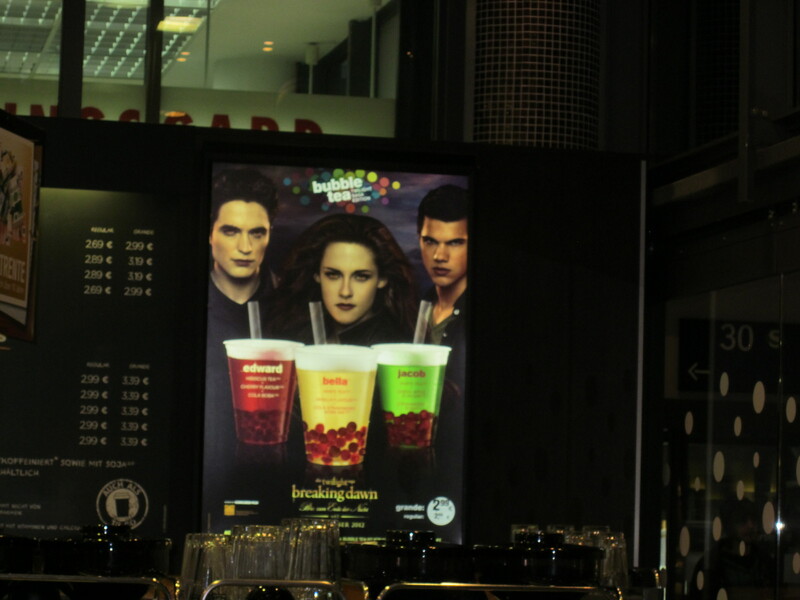 When we arrived at the Nuremburg Hauptbahnhof (German for Central Station) we were shocked to see that McDonalds not only sold Bubble Tea but Twilight Bubble Tea! I sadly did not get to choose between Edward and Jacob Bubble tea’s because we quickly left the Hauptbahnhof to find some breakfast. On the top floor of a department store my dad found a place for us to eat breakfast. 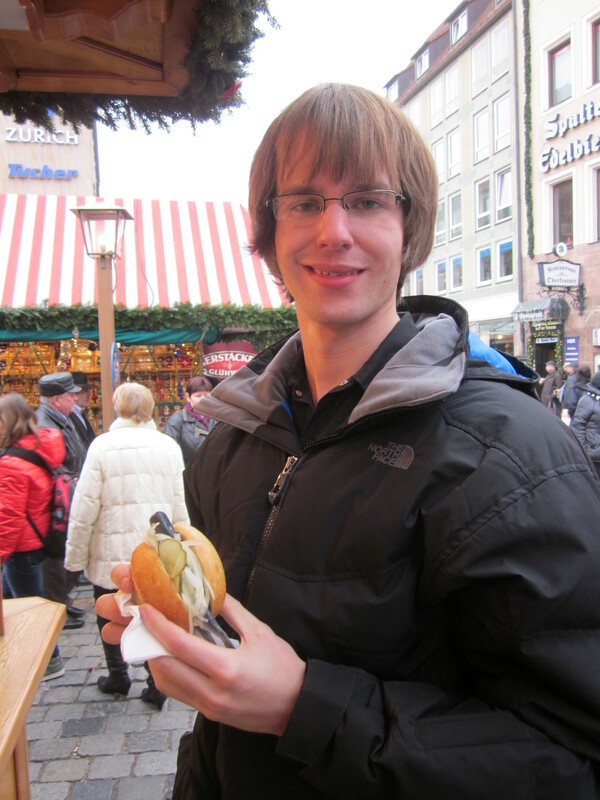 Gavin and I did not eat anything because we were holding out for the goodies at the Christmas Market. Gavin and my dad shared a special Christkindle Markt bier for breakfast while I drank soda water (which is really popular in Europe, regular water is few and far between). 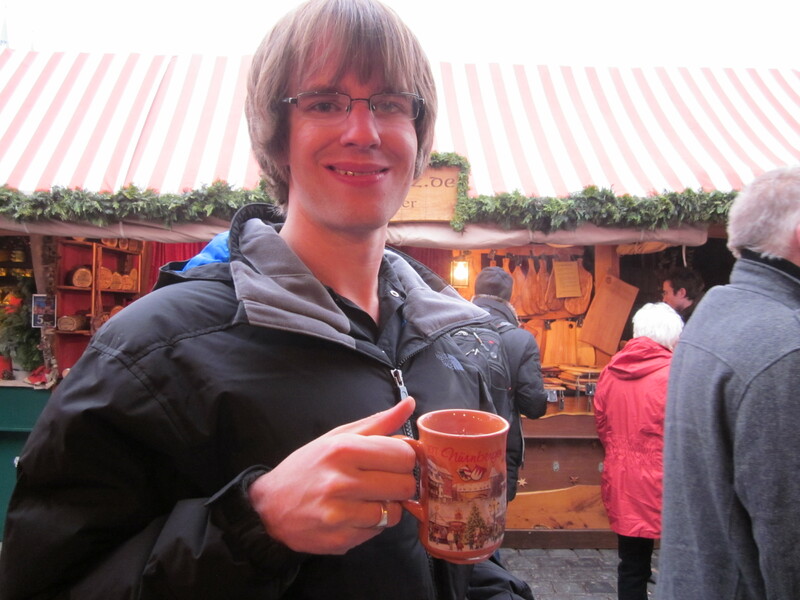 The Christkindle Markt was really exciting. 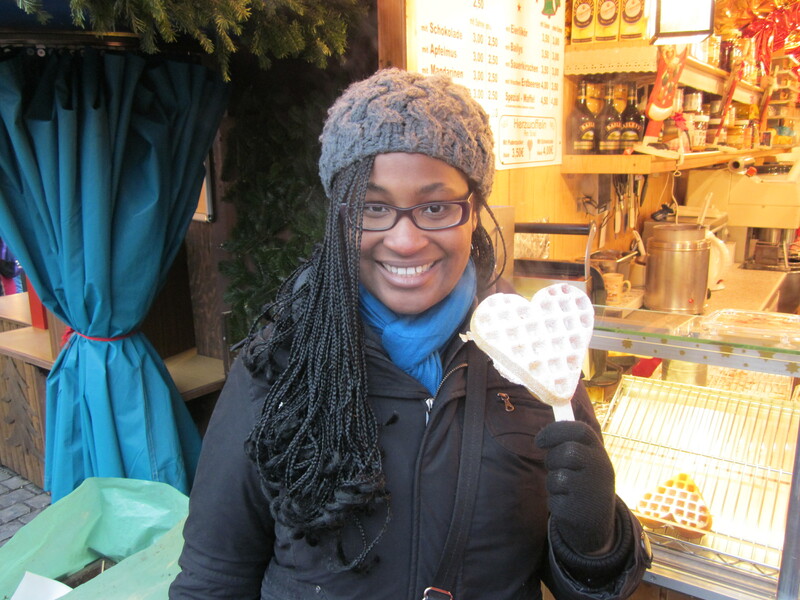 The Nuremburg Christmas Market is the largest one in the world and the second you walked into it you could tell. Apparently vendors have waited for up to 30 years to be able to sell their products at the market. For the most part there was a lot of the same things, wool hats, baked goods, hand made toys, and lots of German food. 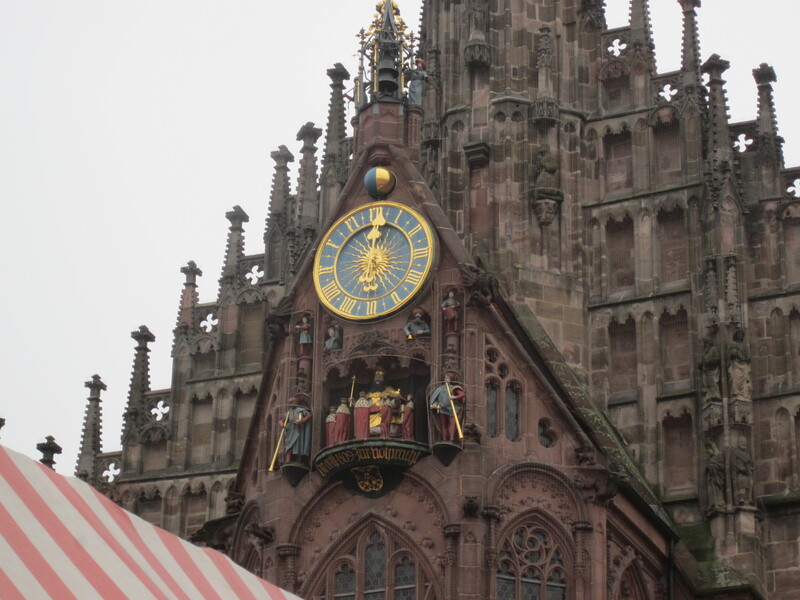 At noon we watched the Glockenspiel ( a giant clock in a church) ring with carved characters elaborately dance around the clock. 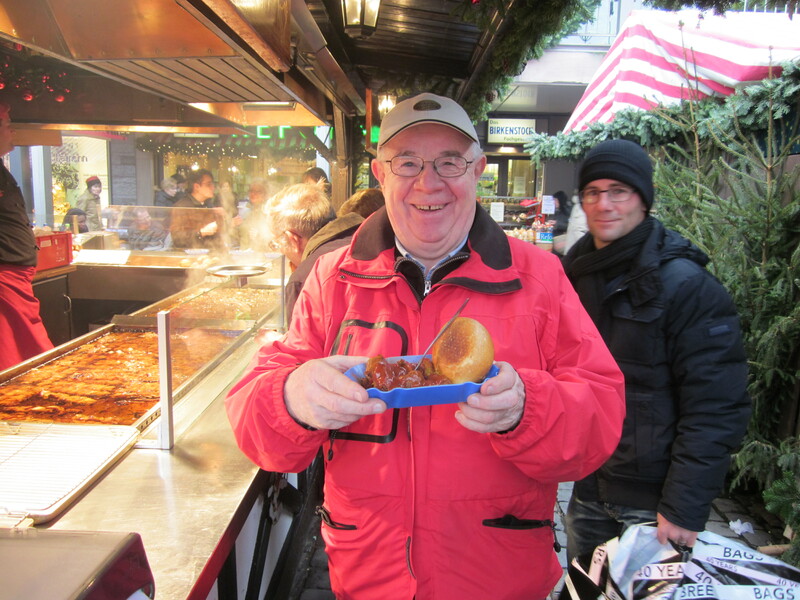 In the photos below: 1) my step dad is holding Schaschlik, some kind of boiled meat covered in curry and other sauces. 2) Gavin is eating a pickled Sardine Sandwich 3) I am eating a Dutch Heart Shaped Waffle 4) Gavin is drinking Glühwein which is warmed sweetened red wine, a classic christmas drink in Germany. 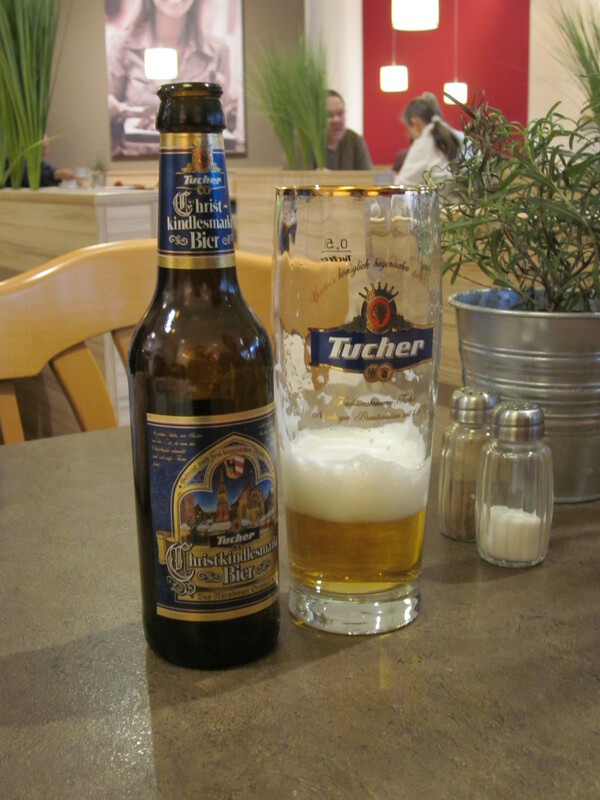 Later we visited the Castle in Nuremburg, then went to the Albrecht Dürer Museum. The museum was cool enough, i think it was made in the house he lived in while he created his works. The only thing was the audio guide we listened to was terrible. Instead of describing anything in the carefully maintained home of the artist, we listened to his wife complain about daily life and the people Dürer worked for. After the Dürer Museum we went to the Nuremburg Trial memorial. Unfortunately the court room where the trials took place was in use. 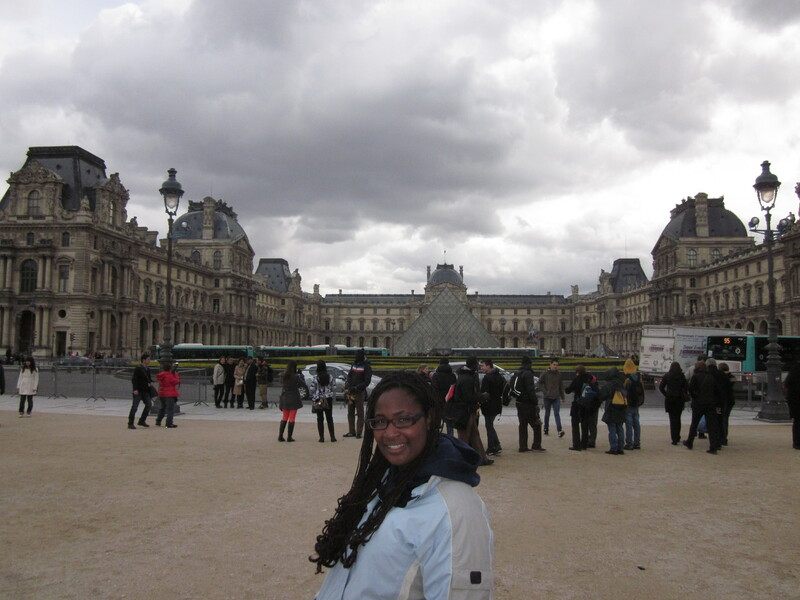 The rest of the memorial was very……heavily dense with text. Which was all in German. So we had to listen to the entire thing on an audio guide which was very long. Before we got through the entire exhibit we had to leave to catch our train back to Ansbach. I wish we were able to spend more time at the exhibit and see the court house but I guess that will be for another day.